ISWAN’s Regional Director in India, Chirag Bahri, delivered a presentation on Seafarers’ Wellbeing at Sea at a seminar on women in shipping in Chandigarh, India. The seminar, entitled ‘Inducting and Empowering Women in Maritime, Shipping and Associated Fields’, took place on 21 June 2018 and was organised by The Nautical Institute India North West (Chandigarh) Branch. 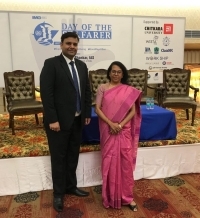 The Chief Guest was Dr. Malini Shankar of the Directorate General of Shipping (pictured with Chirag) and the Guest of Honour was Sanjam Gupta, President of the Women's International Shipping & Trading Association (WISTA) India. Delegates included senior members from the Company of Master Mariners of India, The Nautical Institute and the Merchant Navy Officers Association, along with the Additional Director General from the National Cadet Corps, senior trainers and retired senior decorated defence officers. Attending as a guest speaker, Chirag spoke about ISWAN’s Regional Programme’s campaign to encourage Indian seafarers to join the shipping industry through registered crewing agencies. He also reported on the programme’s work around seafarers affected by piracy and emphasised the importance of supporting the mental wellbeing of seafarers. Chirag informed delegates that ISWAN is committed to working towards increasing the number of women seafarers in shipping and empowering them by working closely with WISTA and other partners. He urged the representatives from the industry to mentor and guide aspiring seafarers to join shipping through proper channels, highlighting that it is the shipping industry’s moral responsibility to look after its own. During his visit to Chandigarh, Chirag also visited the School of Higher Academic and Professional Education (SHAPE) Training Centre where he met seafarers undergoing post-sea courses. He gave a presentation on seafarers’ mental wellbeing, ISWAN’s work in India assisting seafarers and their families, and the importance of being prepared for piracy and other crises at sea. Citing ISWAN’s current campaign, he urged sailing staff to reach out to junior seafarers through social media and raise awareness of the risks of joining shipping through non-registered crewing agencies. Chirag also gave an update on this campaign to senior management at Elegant Marine Services, who he met in Chandigarh, and introduced them to ISWAN’s Good Mental Health Guides for Seafarers.